One of the greatest challenges facing your car mats is the road salt laid down on public streets to prevent ice forming during the winter months. Though practical from a driving perspective, it can also play havoc with your car interiors. You can keep salt from damaging or staining your vehicle’s carpeted flooring by using car mats, but if you’re using carpeted car mats, then all you’re doing is transferring the problem onto another surface. Fortunately, it’s possible to get salt stains out of your carpeted car mats. We’ve put together a quick guide that will help you to quickly and easily remove these unwanted, unsightly marks. Before getting started, make sure that you have everything you’re going to need to remove those ugly white stains from your car mats. 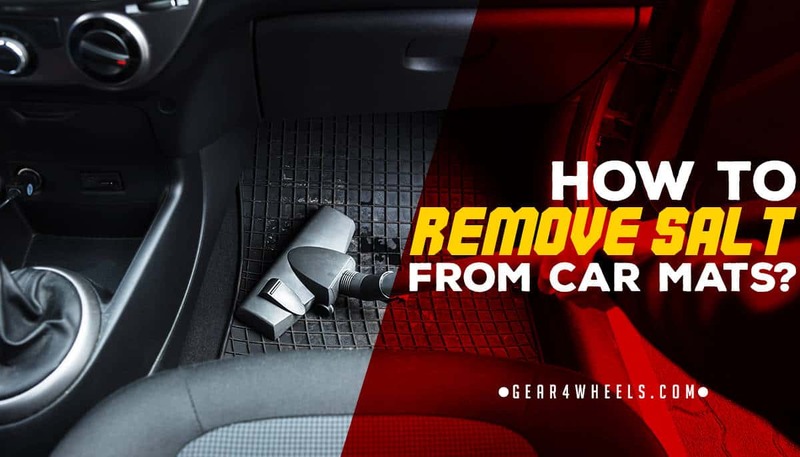 Once you have all the above equipment together, simply follow the 6 steps we’ve outlined below to restore your carpet car mats to their former condition. Begin by mixing together a half-and-half solution from the distilled white vinegar and your hot water. You can do this in the bucket or directly into a spray bottle if you'd like more convenience. Apply the 50/50 solution directly to the salt-stained portions of the carpeted car mats. You’ll find it easier to carry out this step if you’ve managed to get hold of a spray bottle as mentioned above, as you can spray the affected areas as you go. Leave the mat to stand for several seconds while the solution soaks into the salt-stained areas of the fabric. No more than 10 seconds should suffice before you progress to Step 4. Next, use your brush to scrub the affected areas thoroughly. Take care with cheaper products or products that have not previously been washed in full, as you could take away some of the colored dye leaving discoloration. Use the paper towels or fabric towels to dab away the remaining moisture from your car mats, once the stains have been fully removed. If required, you can repeat steps 1 through 5 to treat any stubborn salt stains that haven't disappeared on the first attempt. Once you're satisfied that the mats are clean enough, you can hang them to dry or place them in a warm area indoors or outdoors, but never under direct sunlight to prevent discoloration. It could take some time for the vinegar smell to dissipate, so don’t place them directly into your vehicle until it has completely gone. When winter rolls around, you can avoid the problems posed by road salt by switching out your carpeted- to rubber-car mats. Rubber doesn’t easily absorb substances, meaning that you won’t see the same staining on these types of products. They’re likely to become dusty or turn a little white, but a simple rinse will restore their color, rather than having to clean them quite so thoroughly.